The book has 74 pages, and there are 40 mp3 files. 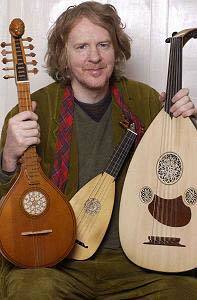 It is the sum of many years researching and performing Scottish lute, cittern and guitar music. The key thing is the performances. There is a continuity of style and technique going back nearly 1,000 years, which I have brought to the modern nylon and steel-strung guitar. As I say in the Introduction, this is more Scottish than 'Celtic'. Welcome to ‘The Scottish Guitar’. One of my chief concerns in this book is to show the stylistic differences between regions of Scotland, and also between periods. Guitars, lutes and citterns have been played in Scotland for almost a thousand years, and have always had a distinctive, contemplative voice. The arrangements in this book unite history with the present. Different areas of Scotland have cultivated different styles. These regional variations are a vital part of Scottish culture, but I fear they are being eroded due to political and economic pressures. In my arrangements, I have tried to reflect the origin of the tunes, with their appropriate ornaments and phrasing. The accompanying CD is essential for a deeper understanding of the subtle art of phrasing, which cannot be found on the printed page alone. I do not consider this music as being ‘Celtic’ - a much overused and abused term. It is Scottish. What makes me say this? Well, there are a number of interpretations of the C word. It is used freely in America to refer mainly to Irish playing, but also to Scottish, Manx, Breton, Basque, etc, etc. When I was a young boy, I could easily recognise the differences between an Irish and a Scots jig. The contours have become less clear in recent years, much to the detriment of the music. I have spent many years researching and performing the historical traditional music of Scotland, and I feel that has given me an insight into a Scottish tradition of performing traditional music on plucked, fretted string instruments such as guitar, cittern and lute. I have tried in this book to both show that thousand-year tradition for what it is, and to incorporate it into later material, from Gaelic song to traditional airs and dances. My main hope is that this book will raise an awareness amongst guitarists and their audiences of the great heritage the modern guitar can lay claim to, and the unique and distinctive style of Scottish guitar playing. Please note, I have nothing against Irish music, or the other regions mentioned above, in fact I love what is distinctive about each. This book (I believe for the first time) attempts to define a uniquely Scottish way of playing the guitar, and it does so not through a dry academic analysis, but through performance - the heart of any musical culture.